On the coastal road from Palinuro to Velia, the medieval village of Pisciotta is picturesquely situated on a hill above the Mediterranean Sea. In the narrow terraced alleys with impressive palazzi dating from the 16th century, you experience the unique atmosphere of real Italian village life. In spite of its closeness to the sea, Pisciotta is far from being overrun by tourists, customs and traditions, which are hundreds of years old, are preserved and kept alive. The medieval alleys of Pisciotta are off limits to cars and motorcycles, but sufficient parking is found around the center. Experience authentic village life while spending your holidays at one of our holiday homes or apartments at Pisciotta! Around the typical village piazza, you find grocery stores and bars. A cash dispenser and the post office are also nearby. We can recommend Ristorante "I Tre Gufi" ("Three Tawny Owls") in medieval Palazzo Marchesale, at the highest point of Pisciotta. 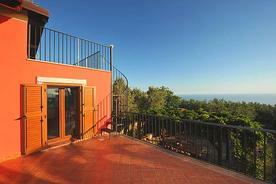 From its large terrace you have got a terrific view of the sea, which you should not miss out on. 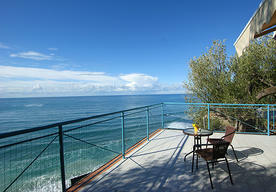 The beach of Marina di Pisciotta is at a walking distance of ca. 1 km along a footpath (partly steps); if you follow the road it is about 3 km. Depending on the current, the beautiful beach has either more sandy or more pebbly sections. Even in midsummer, everything runs at a rather leisurely pace there. It is towards the evening that the atmosphere at the marina is simply charming: To one side of the beach lies the picturesque village, to the other lies the hilly landscape of the Cilento with its gentle green giants sloping towards the sea. Instead of going to the beach of Marina di Pisciotta, you might go to the wide and fine sandy beach of Saline 3 km off near Pisciotta-Caprioli. The more than 5 km of beach are ideal not only for bathing and for building sandcastles, but also for taking long walks towards Capo Palinuro. At the weekly market taking place every Wednesday in the piazza, the displays are often as colorful as the people coming to Pisciotta from the neighboring villages. Countrywomen from the hinterland offer their goods for sale, at the stall "salumi e fromaggi" a chat is always included in the price, kitchen towels, aprons and the typical "caffettiere" are offered as well. After you have done your shopping, stop for a "caffè" and a "cornetto" at one of the bars in the piazza and enjoy this unique atmosphere a little longer! 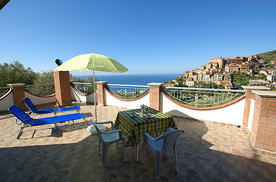 Pisciotta is not only characterized by its panoramic location. Decades-old olive groves have spread around the village and their tall plants have even been named for the village. The oil produced from their fruit counts among the highest quality extra vergine products in the world and has been DOP-labeled since 1998. From the town, you can undertake several beautiful hiking tours along the coast or into the green hinterland. During the summer months motor dinghies can be chartered without license at the harbor of Marina di Pisciotta. The nearest train station Pisciotta-Palinuro is about 3 km from Pisciotta. From the train station, there is a bus of the Infante-Domenico & Co. company several times daily from Marina di Pisciotta via the train station Pisciotta-Palinuro to Pisciotta. The people running the bar at the train station will gladly help you organize a taxi to take you from the station to Pisciotta. In July and August, you can use a shuttle bus service between Pisciotta and the marina for 2 Euro per person one-way. Besides, there is a bus several times daily from Pisciotta piazza to the authentic mountain village of Rodio and to the neighboring coastal town of Caprioli. Interurban buses of the Infante-Domenico & Co. company take you conveniently from Pisciotta to the towns of Palinuro, Marina di Camerota and Camerota. At the weekends from mid July to mid September, there is a boat service between Marina di Pisciotta and the coastal towns to the north and to the south. 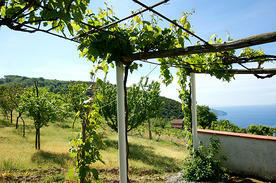 The service is called Cilento Blu and is offered by Alicost. It is a very special kind of experience – Signor Nello’s Ape-taxi (for max. 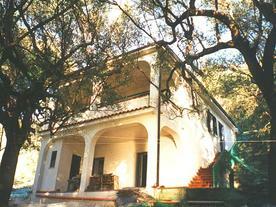 3 persons), which, after prior reservation, takes you, for example, from the train station to the Marina or up to Pisciotta. We will be glad to help you with the reservation. The Ape-shuttle can also be called and used at any other time (not in case of heavy rain), even on the spur of the moment. Just call Nello at +39 339 149 1310, he speaks a little English. Waiting time for the Ape-taxi is, in general, not more than 20 minutes. The Ape runs between Pisciotta, Pisciotta-Palinuro train station, Marina di Pisciotta, Caprioli and Palinuro. When approaching from Palinuro, it is before reaching the piazza that you come across the agency of friendly Simona Chirichiello on the right-hand side of the main road (Via Borgo). At the agency you can rent a car, a scooter or bicycles. Simona also sells train tickets. She organizes transfers from and to the train station as well as half-day or full-day excursions in the Cilento National Park, to the Amalfi Coast or to Pompeii. Simona is at the agency in Via Borgo (the yellow HERTZ sign makes it easy to recognize) in the morning and then again from the late afternoon on. Tel: 0039 0974 973555. Simona speaks English.